Back in the Seventh Century Sweden and Poland were at war, and their navies were fighting one another on the Baltic Sea. The king of Sweden, Gustavus Adolphus, ordered the construction of an armada of new and mighty warships. Among the largest and most powerful of these great gunboats was the Vasa. The Vasa was built at Stockholm by experienced shipbuilder Henrik Hybertsson. The ship was designed to be the mightiest warship ever, with 64 guns on two gundecks. This was a time when the era of warfare at sea was shifting from boarding parties to the use of guns with heavy-enough shot to sink enemy ships. Thus Hybertsson built the Vasa with the concept of the broadside blast of gunfire in mind. She was equipped with heavy 24-pound guns on both her lower and upper gundecks. With all of the guns equipped to handle the same size cannonball, it was thought the fighting power of the Vasa would be more effective. The top gundeck also was located high over the main deck thus giving the warship an advantage of height over an enemy vessel. Or so it was theorized. The ship also was designed to carry a compliment of 300 soldiers to do battle if and when the opportunity to board an enemy vessel also came to play. The craftsmanship of the shipbuilders was outstanding in those days. 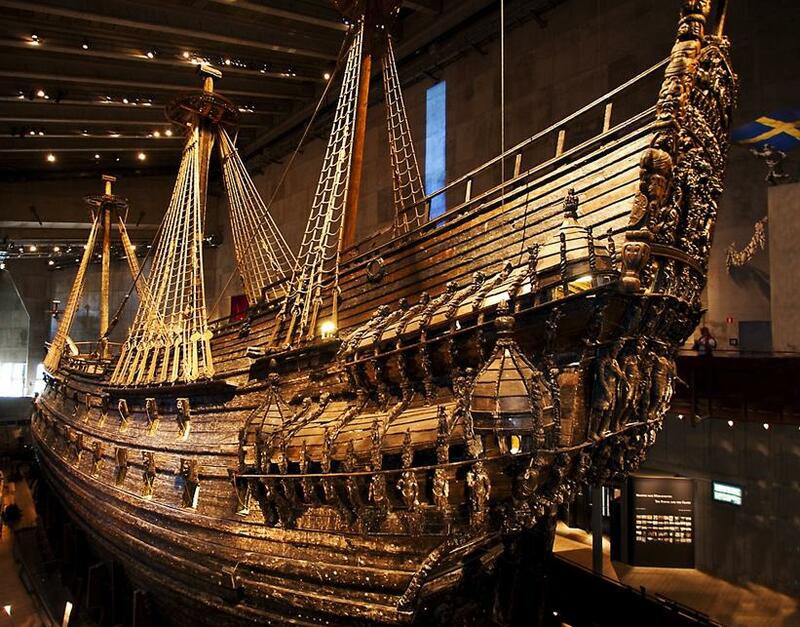 The Vasa was decorated with magnificent carved ornamental works, much of it inlaid with gold, making it among the most elaborate warships ever to put to sea. The bow was decorated with a massive golden lion in honor of King Gustav, and not the more traditional figurehead of a naked woman flaunting her breast implants over the sea. By the summer of 1628 the ship was finished. It was put afloat, and then mounted with the guns, the cannonballs, provisions and made ready. 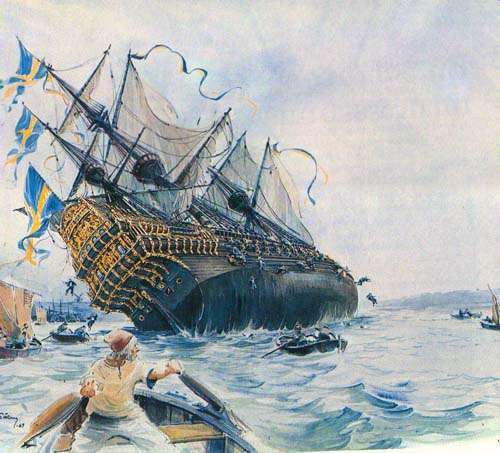 At last, on Sunday, August 10, the vessel, under the command of Captain Sofring Hansson, cast off with a staff of some 150 sailors for its maiden voyage while a crowd of spectators and foreign diplomats gathered at Stockholm to bid good tidings. The event was to have been a proud one, and a moment of important political propaganda for King Adolphus. The sails were rung up and the great ship moved gracefully out of the harbor. When off shore Captain Hansson ordered the cannons rolled out to fire a salute. But suddenly something odd happened. The great ship began to heel over. It righted itself slightly, then heeled over again. This time the list was so great that water rushed in through the open gunports on the lower deck. Then as the spectators watched in horror and disbelief, the grand new warship sank. An estimated 30 to 50 crew members drowned in the disaster. When the Vasa was salvaged in 1961, the remains of 25 skeletons were recovered. At the inquest it was concluded that the Vasa carried too much weight in the big guns on her upper deck, thus making it top heavy. It was learned that the old ship builder, Henrik Hybertsson died during the construction and his brother and partner, Arendt de Groot completed the work. In the end, however, no one was blamed for causing this disaster. It was concluded that the ship was well built, and she carried several tons of stone for ballast, but it was not enough to counter for the weight of the guns and sails. While the Vasa never sailed farther than a few hundred feet and never fired a cannon in battle, the vessel has since been raised and restored. The Wasavarvet, a special museum for showing this magnificent ship, has been opened around it. The ship and all of the things found in it are there for visitors to admire. The museum was inaugurated in 1990.